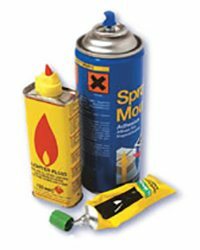 Butane gas cigarette lighter refills, disposable cigarette lighters, aerosol sprays (hairsprays, air fresheners), whipped cream cans and glue tins or tubes. Sniffed or breathed in through a cloth or sleeve. It has been known for Gas to be squirted straight into the back of the throat. Similar to being very drunk. Users feel dizzy, giggly and light-headed. Some hallucinate. Effects last from a few minutes to 30 minutes. Short term: Hangover for a day or two. Nausea, vomiting, blackouts, bad cough, spots/sores around mouth, persistent cold and heart problems. Inhaling with a plastic bag can cause suffocation. It is extremely dangerous to squirt gas into the mouth as this can cause sudden death. Sometimes people’s hearts stop beating if they have been sniffing solvents. Long term: Damage to brain, liver, kidneys, nervous system, lungs and reproductive organs. Solvent misuse isn’t illegal. However, under Scottish law you can be prosecuted for ‘recklessly’ selling any substances to any age group if you suspect or know they’re going to be inhaled. It’s also illegal in England and Wales for shopkeepers to sell you intoxicating substances if they think you’re likely to be inhaling them. Since October 1999, the law makes it an offence to sell/supply gas lighter refills to anyone under the age of 18. This law applies to the whole of the UK. In Scotland, Volatile Substance Abuse (VSA) is in itself grounds for referral to the Children’s Panel -not because solvent abuse consumption is illegal, but because of the extreme danger presented by VSA. What’s the difference between possession & supply (dealing)? What Happens If You’re Under 16?